I hate being the bad guy, I've never liked saying “NO” to anyone, I don't think many people do. Here is a handy guide for exactly how to do this, it's a step-by-step printable that you’ll want to use as a reference point as we go through these steps and it can be reused, time and time again. It walks you through every step and gives you an exact breakdown of the formula to use when you're translating your “NO” into a positive. <<— Grab it and let's get started. As you know, being the “NO” person impacts the way we're seen (and remembered) by others. It contributes as much to your personal brand as anything else. We're programmed societally to believe that if we're not part of the solution that we are part of the problem. We can control how people perceive us. Think of this as an interpersonal PR launch. So, if you're feeling like you have to say “NO” all the time… if you feel like you're constantly giving people the bad news… being on the defensive… pushing back… being the bad guy… being the messenger that everyone seems to want to kill… this is for you. Are you ready for the earth shatteringly simple answer? Do more good and less bad. It's hardly that easy. 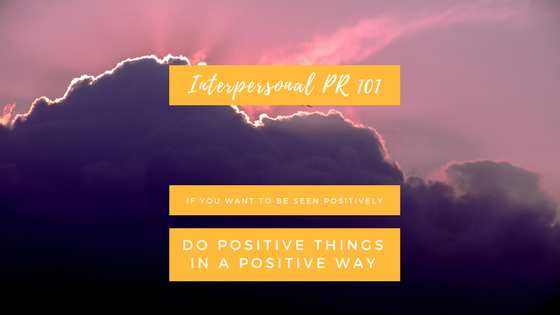 But, if you want to be seen more positively as someone who is solution oriented, someone who's a team builder or a true collaborator, a solution finder, then you've got to do positive things in a positive way. Fundamentally we grow what we sow. In reputations, relationships, karma, as a farmer. It’s a universal truth. Interpersonal PR. People believe what you tell them and you become associated with the way you deliver the messages you put out into the world. Take a step back and think about this: being positive means being trusting. It takes a huge (sometimes painful) leap of faith to assume the best about people, I admit that. It’s one of the hardest things to do. Positivity means being open, not just forcing yourself to assume the best about people but peeling away the layers of assumptions that you automatically make of people. Answer: Being positive means Trusting, being open, willing to learn, willing to generate new ideas, being curious and the corresponding absence of negative behavior. The way this works psychologically is based in the science of perception. What I’m going to teach you is how you're going to train other people to associate you with solutions, to associate you with positive change, proactivity, productivity, progress. We are psychologically going to prime others to perceive us in a positive way. A “NO” come from anyone in your life, but think specifically about your co-workers, your boss, your teammates, your clients. Anytime you hear yourself say, “NO,” let that be a little flag for you that this is an opportunity to use this reframing. Okay, huge disclaimer and miniature soapbox: Positivity does not in any way minimize legitimate risk, it is not trying to make things all sunshine and lollipops, it is not delusional thinking or rose-colored grasses. Risks are important. Some are even critical – read: vital – to our survival as humans and how we've come to exist on the planet. We’re programmed to tune into risk b/c if we tune out from legitimate risks, then we put ourselves in a vulnerable position. It’s the same for our career. If we are tuning out legitimate risks, then we miss things that can catastrophically harm our initiatives, our projects, our programs, our teams. This is not telling you to ignore risks. This is a tactic for reframing the risks into solutions. Soapbox step-down. Let's move on. You've identified the “NO.” The next step is to audit your thoughts in order to stop ruminating on the negative. This is so important. Ruminating or indulging in anxiety that we sometimes feel when we say “NO” (like we might be letting someone down or seen as less than ideal – anyone?) can be negativity quicksand. Now let's take a look at what the problem or “ASK” is that needs to be solved, while giving yourself that moment of willingness to be open without overlaying any of the “NO” reasons – practical and likely though they may be. In this internal audit, listen to what you're saying out loud and what you're thinking. If you keep running over and over and over the same soundtrack of reasons why this idea’s a “NO” or why this “ASK” is impossible, then pause right there. As another flag, consider - Have you sensed yourself feeling anxious about this? Anxiety and rumination feed each other; they’re cyclical. The more you think about something negative the more anxious you get about it, the more likely you are to see real or imagined evidence to support the negative thought, so the more anxious you get about it, and the more you ruminate… stop! You can even acknowledge it out loud. This really helps me shake off the freight train of thoughts that tend to run off the tracks when I’m feeling anxious. Something about verbalizing the need to stop makes it feel less abstract. I want to make a special call out a tremendous resource for those of us with anxious tendencies: Dr. Alice Boyes created a book called “The Anxiety Toolkit.” If you are someone who feels like you're dealing with anxiety constantly, you can learn more about this resource here: http://theanxietytoolkit.com/ (not sponsored). Dr. Boyes says it so well, “Rumination and worry tend to be associated with being closed to new ideas,” which will put you in a negative light to those you work with. It’ll also prevent you from being a collaborator because if you're closed off to new ideas, there's no way you can move forward and there's no way that you can help your team get where they need to be, and there’s no way that you can progress yourself. Check out her site for the book and other resources if you want more details on how to break out of that negative rumination-anxiety cycle. Alright, next step. You've identified the “NO”, you've stopped ruminating on the negative and all the reasons why it doesn't make sense; the next step is really my favorite. This is where you get the facts. Here, you dig into the research, do some observation, do some critical thinking. What you want to understand from the all the people involved is what value the “ASK” will ultimately give. When I say “value,” I mean emotionally, I mean physically, I mean with status politically… What value will this “ASK” ultimately deliver to them or to those that they esteem? Here’s a shortcut to understanding the real, root of the “ASK”… Answer: Why is this is important to the asker? And then try to answer for yourself, “So what?” Answer and then repeat, “So what?” five times. Along about round three, you’re gonna start to hit the real reasons why this ask matters to the people making the request. EXAMPLE: The head of IT wants to reallocate some work to your cost center. So that her team doesn’t own the responsibility for delivery. So that they don’t have to prioritize this work over competing priorities. So they don’t have to take team members off peak-readiness efforts. Because they’re resource constrained and at current allocation, cannot do it all. If they take it on, they will likely fail to deliver this in front of the high-demand client. Focus on what is possible and different ways to get there. This is where you've got to keep going. You've got to keep learning, keep researching and be open. Now, think about all of the different additional ways can this root “ASK” can be met. Create here. Be imaginative. No one is auditing your mental whiteboard here. Don’t sweat the details. Don’t reign it in. Be open to the possibility that this need can be met in way different from how it was asked. There you go. Consider the “BUT” ;) You've got the facts, you've been really creative with considering the “BUT,” and now we're on to step 5. 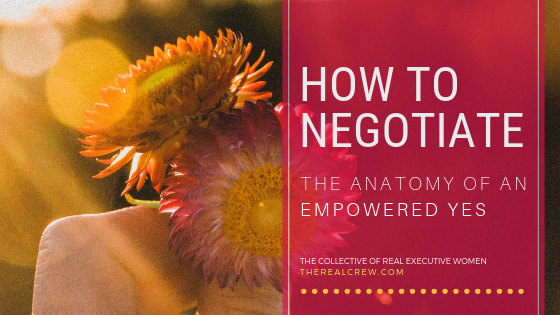 In the guide, I've got the formula laid out for you but here’s the take home message: Frame what you can do and your proposal in a positive light. Now that you know the real “ASK”, you know who your audience is, you know what value they're ultimately after, you want to frame it positively while candidly stating what you can and cannot do, but wrap it up with a solution. When you wrap it up with a proposal, you don't just go in there with a flat “NO.” You become the solution finder, you become the team member who lifts others up and you become the person who constantly gets difficult asks done despite the worst odds. Summarize why it's important to them. You align yourself to their values and they feel like you're on their team when you can communicate back to them why that “ASK” was relevant, valuable and important. This is my #1 alliance and trust building tool. Next, clearly outline what you can and cannot do from what they originally asked. Highlight why and keep it brief. For example, if it's a cost constraint, if it's a resource constraint, if it's a timeline constraint, if it's just something that's not quite feasible - that's fine. Tell them in simple, straightforward terms, no huge explanation needed. Hit it at the summary level. 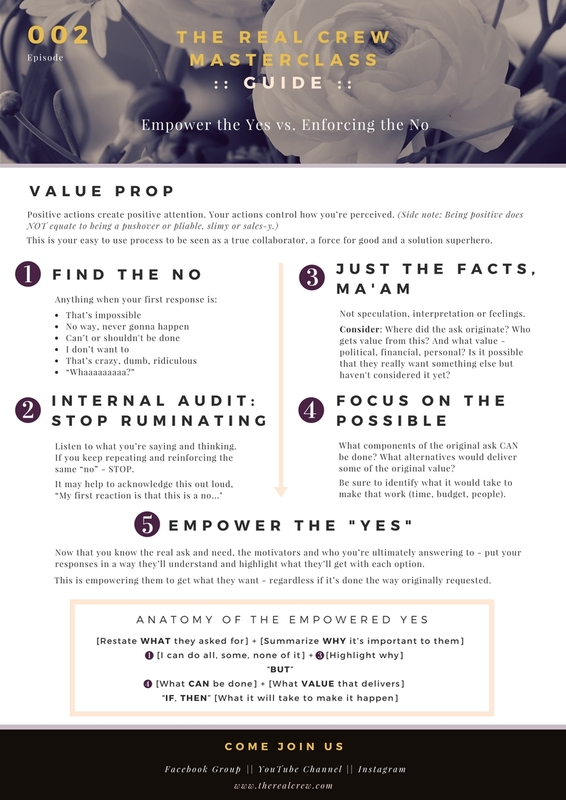 THIS Empowered Yes approach will get you recognized. This will get you appreciated. This will get you empowered with more responsibility and advancement opportunities and this is absolutely the right way to do it. Using this five-step approach is powerful, dynamic-shifting stuff. Let’s review, top to bottom. Step 1: You were asked something that you said “NO” to as immediate reaction. Step 2: You heard yourself say “NO” to it, so you immediately stopped ruminating and emphasizing the negative about why the original ask was unpalatable, dare I say impossible. Step 3: You dug in to get the facts about the actual “ASK” and understand where they were coming from, why it’s important to them. Step 4: You are creative, and you imagined what is possible. Step 5: In the truest possible sense of cooperation and collaboration, you've run through this with them in a positive light based on what is doable. BONUS POINTS: (I love this!) If you can go back to them with the “NO”, with your proposal, and you give them actionable things that they can do for their next step. You’re building your value and your credibility here when you can tell them that you've already engaged the right people, if you've already assessed the level of effort, if you've already gotten budgets in place, if you've already aligned the team so that they're ready to move when somebody makes a decision. This proves you’re not only proactive in getting it done but you've thought about their needs and you've taken it to the next level. If you want something from other people, give it. If you want to be perceived more positively, give more positivity. It's the same simple principle as what you plant will grow; so, plant positivity, grow positivity. If you want more positivity in your life, you are invited to join our private Facebook community of professional women, supporting, uplifting and encouraging each other to live in the fullness of our joy in all aspects of our lives and careers. You can request access right here: therealcrewgroup.com.